"Not the most engaging title for a new book; but, an accurate description of the latest guide from Paul Lipscombe. Better known for his titles on landscape photography and his work teaching at the Arts University College Bournemouth; this fascinating new publication offers an informative, yet practical guide to the use of classic historic lenses in modern photography.Featuring large format lenses from Dallmeyer, Goerz, Meyer, Ross, Taylor Hodson,Wray, to name but a few; as well as the more well known, in Today's market: Rodenstock and Schneider. The book is well illustrated with photographs of the lenses, as well as, taken with the featured lenses; making it the 'must have' large format photographers reference book. Full Colour Softback Book, 168 Pages." "A practical guide to the choice and use of historical lenses in contemporary large format photography. 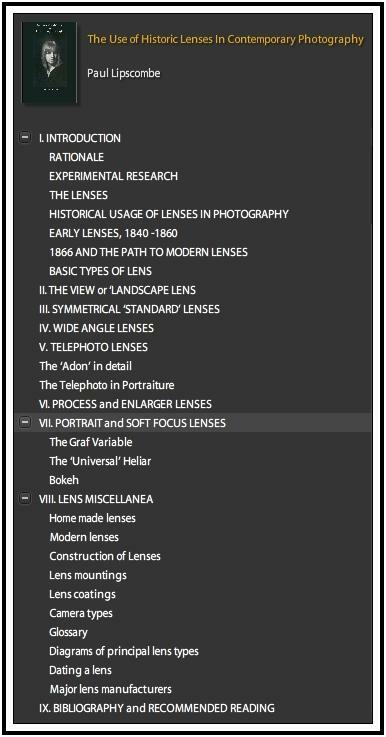 There is a full description of most lens types made since 1850 and many illustrations showing the wide range of uses to which they may be applied. The book is intended as a practical guide for the large format photographer, or for any photographer interested in exploring the wide range of technologies used in the pre-digital age. The writer is a Senior Lecturer in photography in Bournemouth, UK." The book is sold in a few places on the 'net. Itunes has it for $ 16.99 for an ibook download. I purchased an Adobe Digital Edition (free Adobe Download) EPUB format via lulu.com for $ 17.61. Robert White carries a paperback edition too for �22.00 to �28.00, depending on where you live. Not on amazon yet, but I bet it will be soon. I thought I would post a small review on the book and get right to the point. 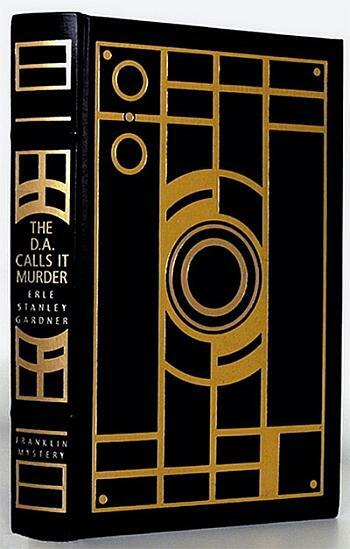 The book is easily worth the asking price. I would highly recommend this book to those who are new/beginners to using older and antique lenses in image making. I would also recommend the book for those of us who have already dabbled in older lenses ("intermediates") including soft focus examples because the book gets the "juices flowing" and rekindles interest. Another nice feature for newbies and intermediate folks are the numerous examples of images taken with various lens makes and types; very useful comparisons. The quality of the images in the book are excellent and very illustrative. The table of contents is shown below. Good range of topics covered, albeit with only a few pages devoted to each. Images from the book are shown below. All images are Copyright Paul Lipscombe 2011. All Rights Reserved. I have no relationship with the author, nor receive any referral fees on this item. 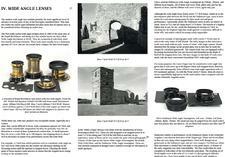 My interest is to a highlight a worthwhile book on the topic of Antique & Classic Lenses. 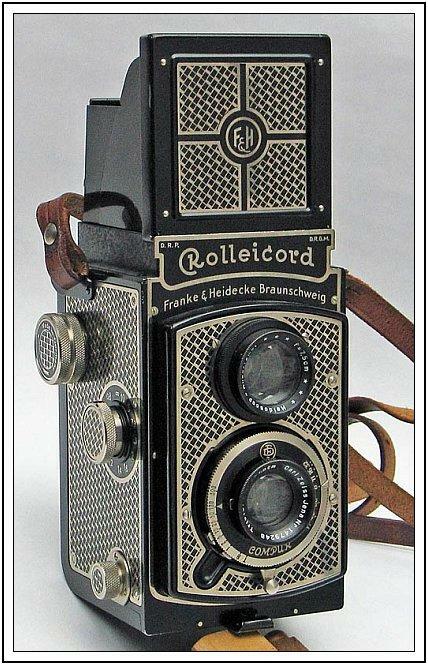 The patent for the Art Deco pattern for this camera is registered to Paul Franke and Reinhold Heidecke and is issued as D.R.G.M. 1328226 - Brunswick, Germany; October 14,1933. 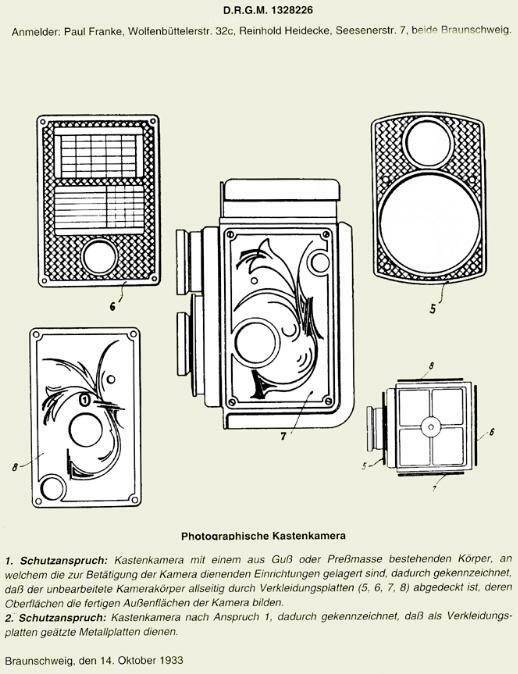 "This is the most fascinating utility patent ever filled by F&H. 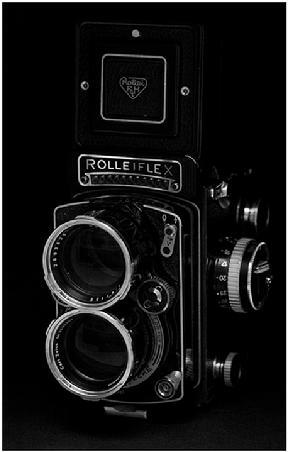 Its purpose was to distinguish the Rolleicord from the Rolleiflex by means of decorative patterns..."
The 1st Annual Antique & Classic Camera Image Contest in complete. 54 images were submitted with 6 images selected as finalists. The winning image belongs to Mr. Garrett Allen, image # 2 shown below. There were a total of 93 votes and the margin of victory was just two votes over Jay Javier's Kitten image. In case you were interested, I thought I would share my own thoughts about the images and why I selected them as finalists. # 1 I like the lighting and how the camera emerges from the background. # 2 The composition is strong and the subject matter is interesting. # 3 The composition, bokeh and the toning of the image are attractive. # 4 Composition, lighting and subject are all done very well. # 5 This is just plain fun and brings a smile to those who see it. # 6 Lighting, composition and image effects are all executed to a very high standard. Thanks to all of you who submitted images and to those who voted. I have created an Excel spreadsheet with all the votes (below) and have removed all email addresses to protect from spam. I hope people enjoyed the contest. Thanks again ! 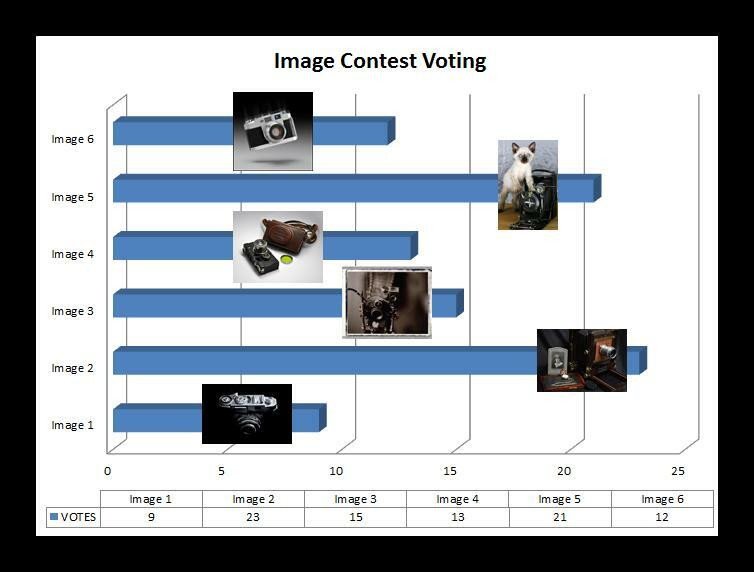 Today is the last day to place your vote for the Image Contest (see below). 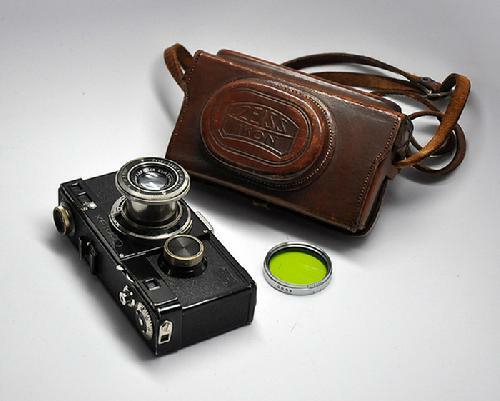 Leica has long held a reputation for quality and exacting standards. 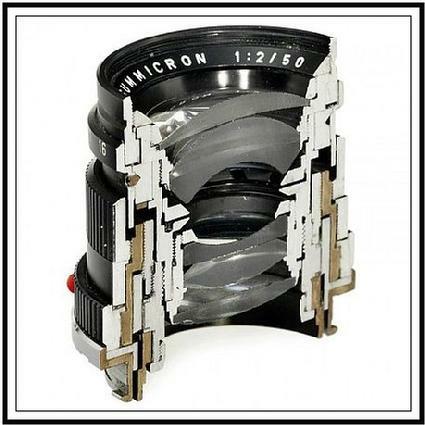 See a short video highlighting their current day lens production practices. If you have been following the saga related to the Image Contest voting, I regret to inform you that some person(s) manipulated the voting and corrupted the results thus far. So, I have decided to change the way voting is done and will now require a legitimate email address is posted along with a validation question to help eliminate any funny business. Also, votes will require my approval before they are posted to ensure the validity of each vote. Its not fool proof, but this process will have more controls than before. Its a shame this happened, but live and learn. Please note your email address will not be shared nor used in anyway, however it will be visible during the voting period. Once the voting is over, the poll will be deleted so email addresses are not used by others. So, below you will find the new mechanism to vote along with the images. Please select ONE image, by number (one through six), that you feel is the "best." I will extend the voting one week with the voting ending on November 5th. I will tally all the votes and the Grand Prize Winner will be announced and paid $ 100.00 on November 7th. In the event there are any other issues with voting or there is a tie, I will select the winner. Run, dont walk to take advantage of his offer. * Free except for shipping and paypal fees. A great and generous offer by RRANKIN on APUG. 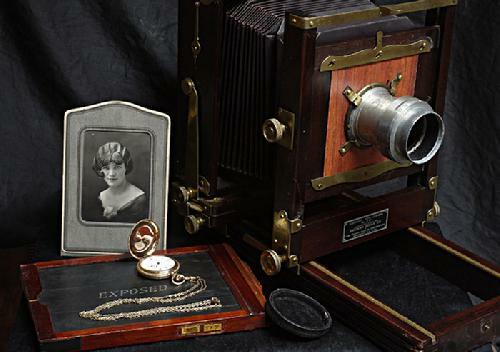 Most collectors of antique cameras eventually succumb to the beauty of red bellows folding plate cameras of the 1885-1910 period at some point in their collecting journey. Its hard not to appreciate the beauty of polished wood, brass and red bellows in such a compact package. These are stunning cameras to have on display. 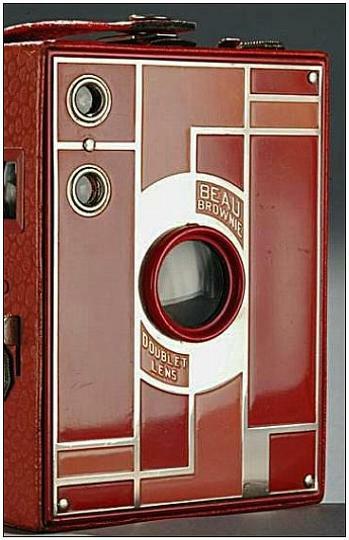 While most of these cameras are not rare due to the large quantities produced, fine examples in beautiful condition are a treat and should be preserved. Most examples sell in the $ 125-250 range depending on the exact model and condition, allowing most collectors the opportunity to own a fine example. 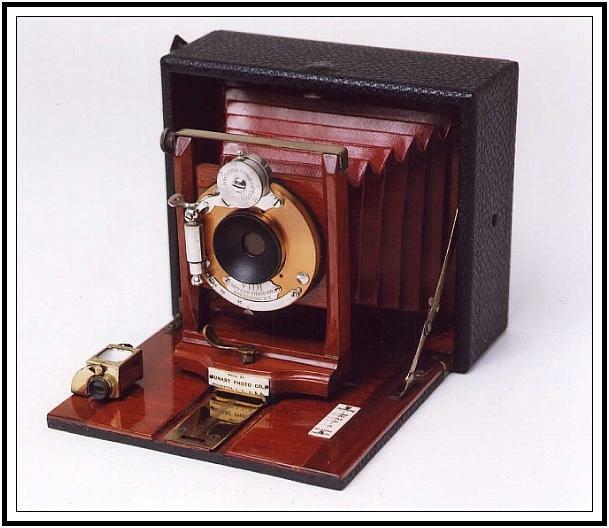 Below is an example of such beauty - a circa 1895 Sunart Folding Plate Camera (see my full article on this camera here). Thanks to everyone for sending in images for the contest ! A total of 54 images were sent in. Below are the images I have selected to be finalists. Please vote for your favorite. Voting will run from October 16 through October 30th. The winner will officially be announced on October 31st. Originally, I was only going to post 3 images as finalists but decided on increasing the number to 6 images given the diversity of images sent in. Thanks to all who participated and good luck to the finalists. Just two days left to submit your entry in the Image Contest ! Please scroll below to the October 1st posting for all details !! Win $ 100.00 sent via Paypal to the Grand Prize Winner. 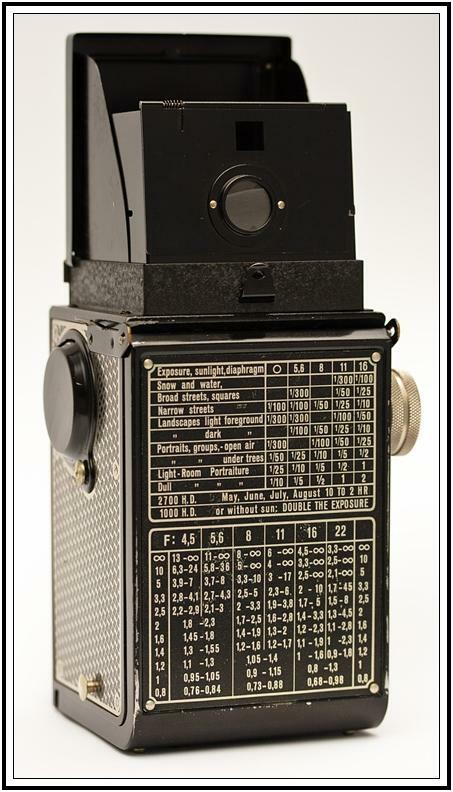 The George Eastman House is an immmense resource for those interested in the history of photography. Having said that, I feel that the Eastman House is a bit behind other organizations as far as providing more information and research online, but that appears to be slowly changing and evolving. Below are a few wonderful videos that the Eastman House has released recently that I hope you find interesting. There has been a lot of interest in the Image Contest. Keep your submissions coming ! At the request of a Blog reader, I have added a simple SEARCH page for my entire site. While the Search Engine isnt perfect, it works. Give it try to search the entire site for specific content. 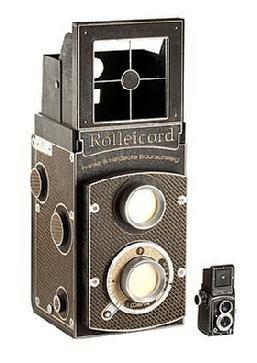 For the last year or so, I have been seeking out a Rolleicord "Art Deco" model to add to my collection. 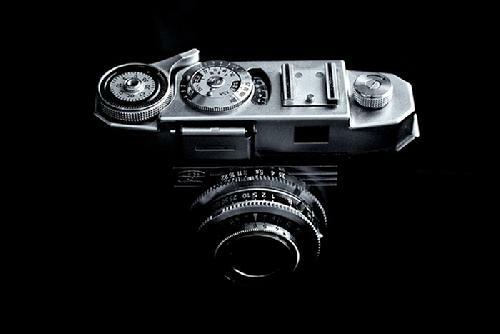 I feel this is one of the most beautiful cameras ever made. The problem with this camera is finding one in excellent condition. Most are in very poor cosmetic shape. Virtually 90% of all of the Art Deco 'Cords you see on eBay are cosmetically challenged. The table on the reverse is commonly worn away and/or displaying green gunk from chemical reactions of the metals and finish. The black enamel paint is frequently chipped or worn away as is the Art Deco finish. 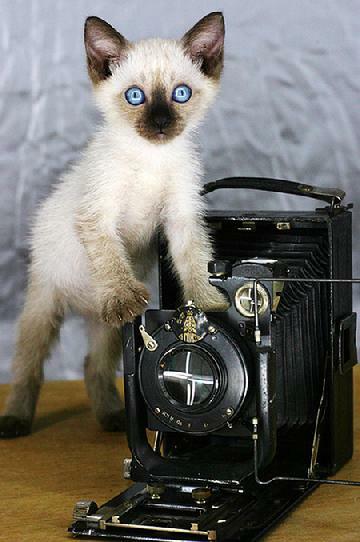 Whatever the reason, the camera seems to have a delicate finish. Needless to say, it took me about a year to find an example in what I was consider close to mint- condition. 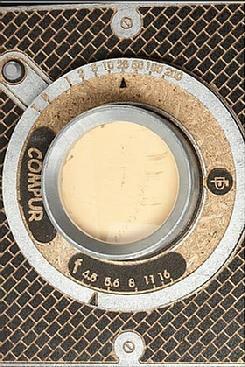 Cameras like this had to have lived in their original cases with little use over the last 75 years. 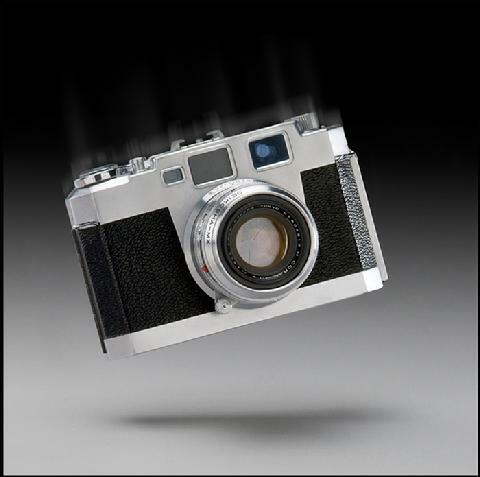 Repeated use and/or exposure to the elements seems to easily impact this camera's condition. Below is the example I acquired at great expense. I will write more about this camera in an upcoming blog post, including high resolution images of the camera. 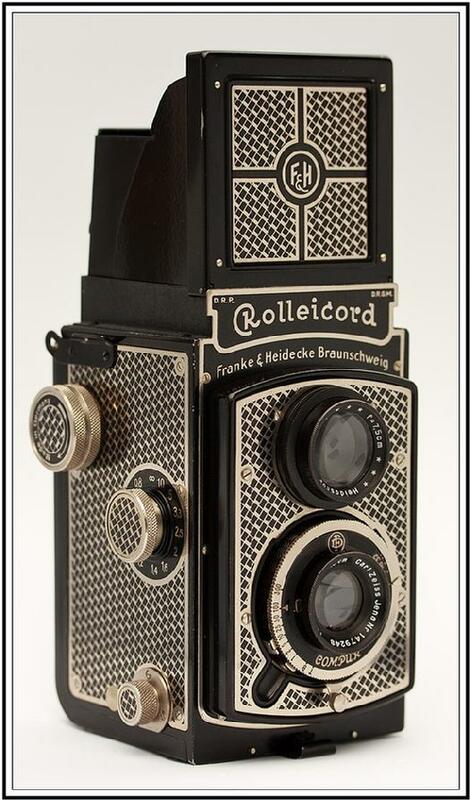 Follow this link to see how most Rolleicord Art Deco cameras look today. 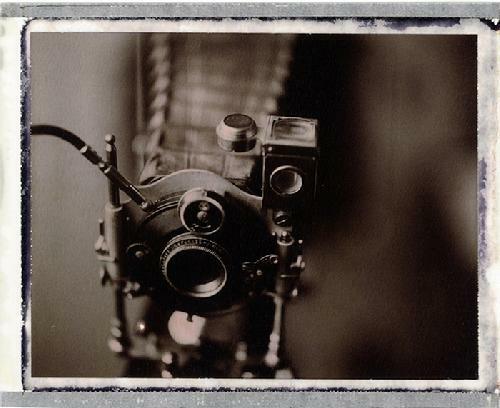 Starting today, I am accepting images of Antique and Classic Cameras or Lenses, or any photographica for that matter, for a contest that I am sponsoring. Among all the entries, I will select the top 3 images and then post them on my website for viewers to vote on and select the final winning image. Winning photographer will receive $ 100.00 CASH sent via paypal. 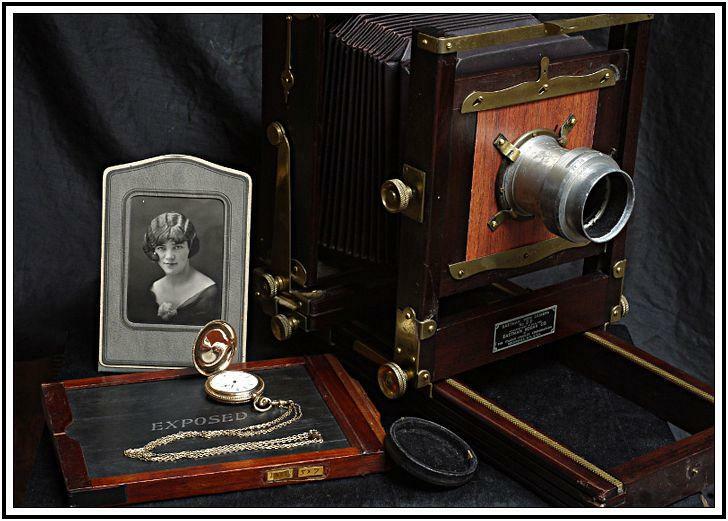 If your image is one of the finalists, it will be showcased on the antiquecameras.net website and/or Blog. 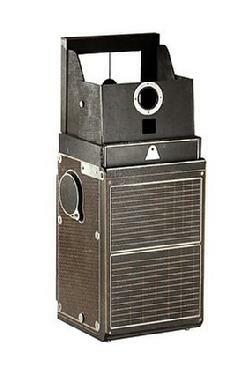 Image should be of any item of photographic interest within the 1839-1959 period. Top 3 images will be selected based upon originality, aesthetic appeal and subject interest. Limit of 3 images per person. Each image should be sent in individual emails. I am accepting images for the period of October 1-15th. However, I do reserve the right to extend these dates if interest warrants it. On or about October 16th, the 3 finalist images will be put on the site for voting by the viewers of my site. Voting will finish on October 31st. Final image winner to receive prize no later than November 5th, 2011. Your submission must be taken by you. Submit one image per email. No zip files, please. In each of your emails, please list your credit information for your image (ie.., Copyright John Doe 2011 ). The image dimensions must be somewhere between 400x400 and 850x850 pixels. Ideal size for landscape images would be no more than 825 pixels wide. Ideal size for portrait format would be no more than 550 pixels wide. To ensure smooth loading, no photo must be no greater than 1Mb in filesize. I will reply with a message that your images were received. While my collecting focus is mainly on pre 1900, American made cameras and lenses, I keep an eye out for the fun and unusal that's related to photography. Below you will find a few pieces of photographica found on Ebay recently. 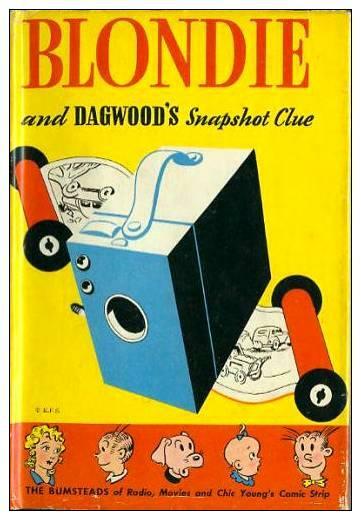 The first item is a book called, "Blondie and Dagwood's Snapshot Clue," published in 1943 with a great dust jacket. These typically sell for $ 10-20 which makes it affordable for any camera collector. 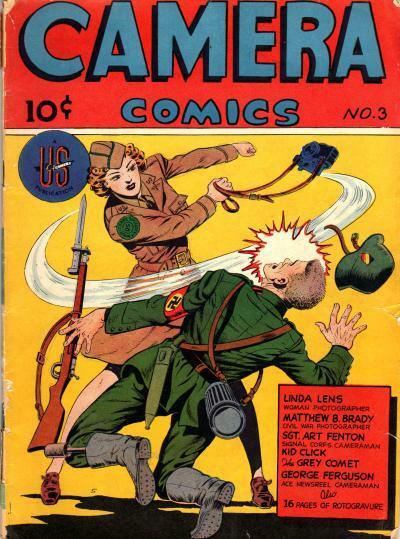 The next item is one of a series of comics called "Camera Comics," published by the U.S. 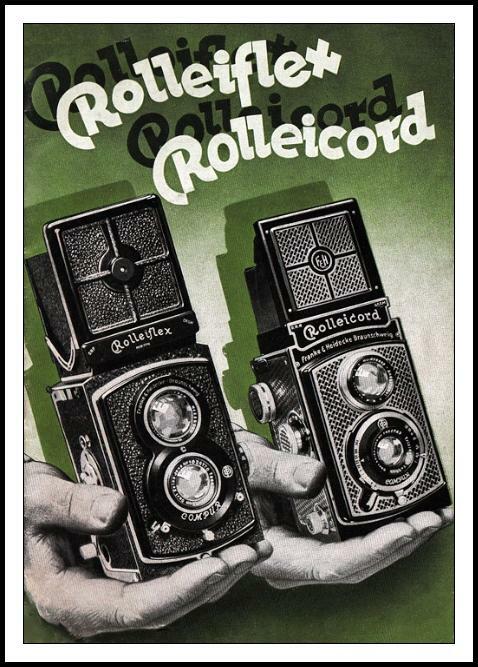 Camera Publishing Corporation first in 1944. 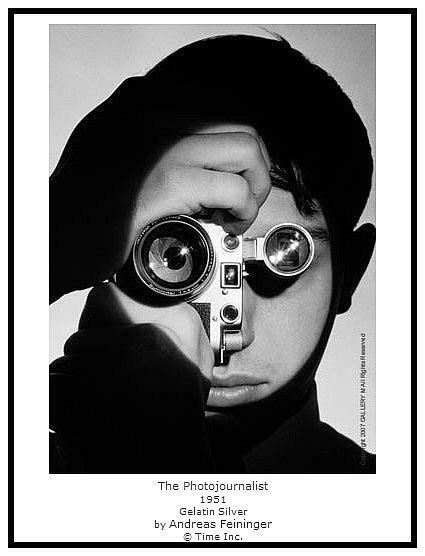 Featuring hero, Linda Lens as well as short articles on the history of photography, it's quite a neat item. And as luck would have it, someone has scanned and posted 8 of these issues online for free ! Click here to access those copies. 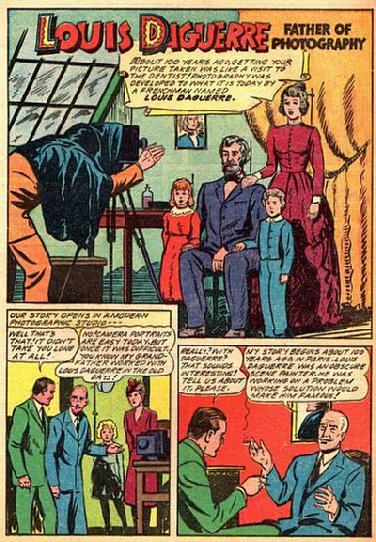 Issues from this series typically sell for $ 20-50 depending on condition. When you think of Ihagee, you think of Exakta don't you? 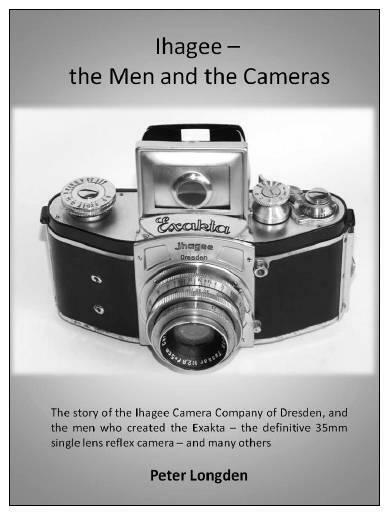 But Ihagee was so much more...come learn about this fascinating camera firm with a free and recently updated 159 page book (.pdf file), online right now. Thanks to the author Peter Longden for making such an incredible resource available to everyone for free. Cool. Also, please note this is a 7mb pdf file and takes sometime to download - be patient.